Prior to her historic title defence against Asuka and Charlotte Flair at the TLC pay-per-view tomorrow night, SmackDown Women's Champion, Becky Lynch spoke with Uproxx in yet another interview and during the conversation, Lynch revealed why she and Ronda Rousey will be the main event of WrestleMania 35. 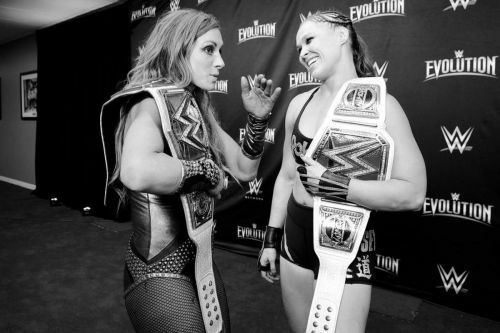 WWE SmackDown Live Women's Champion, Becky Lynch was initially set to face Raw Women's Champion, Ronda Rousey in a highly anticipated singles match at this year's Survivor Series pay-per-view. However, due to Lynch suffering a concussion at the hands of Nia Jax during a Raw invasion angle prior to Survivor Series, WWE had to scrap the scheduled match between Rousey and Lynch, who was medically not cleared to compete, and replaced the Irish Lass Kicker with Charlotte Flair, who stepped up to challenge 'The Baddest Woman On The Planet' at Survivor Series. Lynch further added that she is by the most interesting superstar on the roster today and in recent memory as well. Regardless of whether it is on TV, social media, on backstage interviews, or on the E&C Podcast for that matter, it is Becky Lynch who has been drumming interest left, right, and center. "I’ve drummed up more interest than anybody else in recent memory - than anybody else, and it’s across the board. On TV, on social media, on backstage interviews, on whatever interviews, on the Edge & Christian podcast, I’ve been drumming up interest left, right and center... I think that there’s only one person that can step up to that plate. There’s only one person that’s ‘The Man’ and ‘The Man’ should be main eventing WrestleMania." Lastly, 'The Man' added that on any given day, any superstar can be the chosen one, however, she would rather have the WWE Universe pick their choice regarding who deserves the most to be on the main event of WrestleMania. Becky Lynch is set to defend her SmackDown Women's Title against Asuka and Charlotte Flair, later today in the first-ever all women's TLC match.